National Basketry Organization's exhibition "All Things Considered 9", American Art Company in Tacoma WA. BLEU is part of a traveling juried show with the National Basketry Organization’s “All Things Considered 9” exhibition showing at American Art Company, Tacoma WA, July 20 – August 26, 2017. Followed by an exhibition at Peters Valley School of Craft in Layton, NJ, September 16 – October 29, 2017, and then at Society of Arts + Crafts, Boston, MN, March 29 – June 9, 2018. 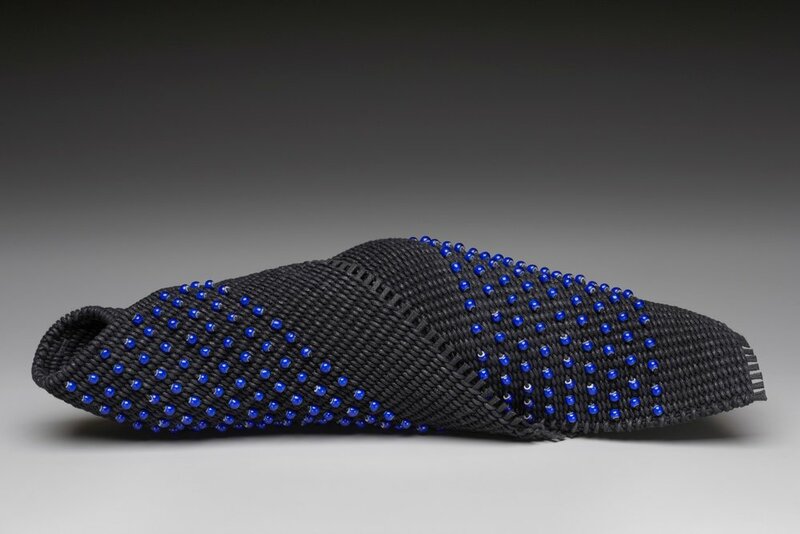 BLEU - Waxed cotton with cobalt blue white heart beads woven into the structure.